All people experience pain and suffering, illness and death, depression and anxiety, fear and worry, hunger and thirst, failures and successes, and love and happiness. Why don’t human beings work together to alleviate the sufferings and pain of each other rather than fight and kill one another? In addressing this issue, the author has looked at India as an example. India is a microcosm of the world with its multiple languages, races, colors and caste system. Why hasn’t a country like India progressed as a developed nation with its vast resources, including the human resource? There are no easy answers to this question. The author explores some facets of Indian life and looks at alternative approaches. The book attempts to challenge people to grow and develop. It is an invitation to objectivity and verifiable truths that are accessible to all, easy to understand and put into practice. 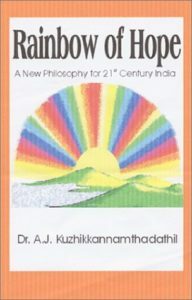 To that end, The Rainbow of Hope opens up a huge reservoir for action. Ultimately, it is action that will transport the nation of India into a just, progressive and developed society in the 21st century where all citizens can live up to their potential without discrimination.